The public presentation of history is often driven by anniversaries, and Britain is just beginning a long Georgian moment driven by the 300th anniversary of the Hanoverian dynasty’s accession in 1714 and commencing (after the birth of little Prince George this summer) with the British Library’s new exhibition Georgians Revealed: Life, Style and the Making of Modern Britain. Viewing it from afar (online), I like the exhibition’s emphasis on Georgians rather than the more boring King Georges, and its inclusion of some of the more interesting aspects of the era: the development of “celebrity culture”, the “commercialization of leisure”, the emergence of the novel, and intensifying consumerism in many realms of life. But from my own distant Anglo-American perspective, I’m noticing a distinct lack of a colonial presence. 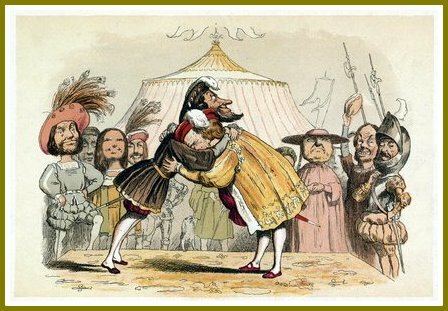 Before the Revolution, we should certainly consider the people who inhabited British America as Georgians, so I’m featuring a few of my favorite American Georgian gentlemen here. Although I don’t have quite the same connection to them that I do for some of the people of the earlier era in which I specialize, there is something compelling about both their images (personas) and their stories, if only because several of them walked on the same streets that I do. My Georgian Gentlemen: Benjamin Pickman, the dashing Loyalist Salemite and husband of the faithful Mary of my last post. What better Georgian than a Loyalist? Even though he left his family and country, his letters testify to the earnestness of his decision and the pain he endured from the separation. 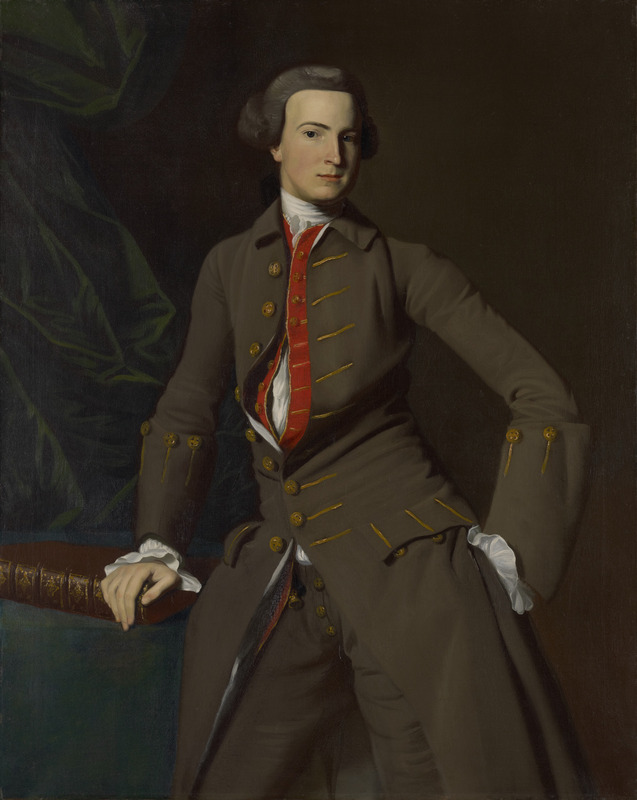 Here John Singleton Copley pictures him as a young man, well before this rift, and I think he looks both dashing and earnest. 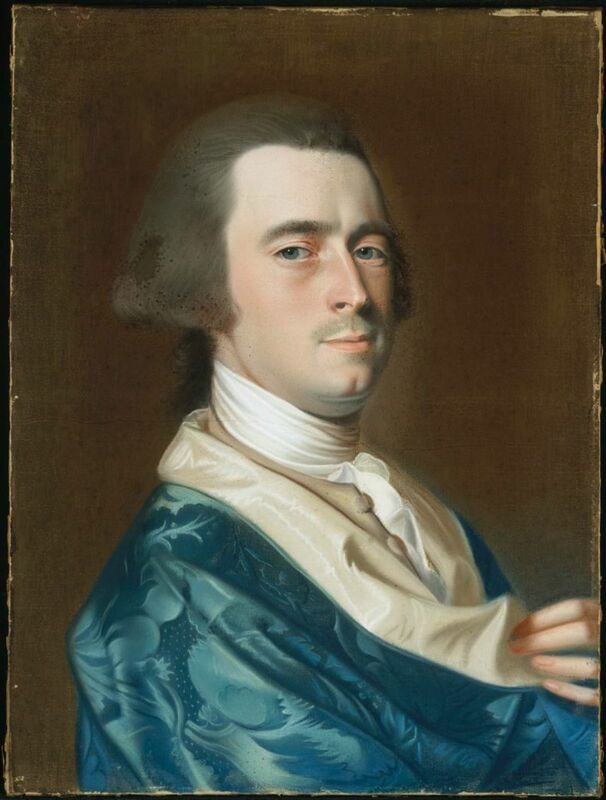 Jonathan Jackson, a contemporary of Pickman’s from Newburyport, painted in his resplendent blue robe by Copley. Jackson looks a little more “Georgian” here but he was no Loyalist: he converted his merchant ships to privateering vessels during the Revolution and later served as a Massachusetts delegate to the Continental Congress. His first wife, Sarah Barnard Jackson, was the daughter of the Reverend Thomas Barnard of Salem, whose silhouette is below. As a true Georgian, Barnard helped avert what might have become the first clash of the American Revolution in early 1775–an incident called “Leslie’s Retreat”–when he negotiated British Colonel Alexander Leslie’s retreat from Salem. 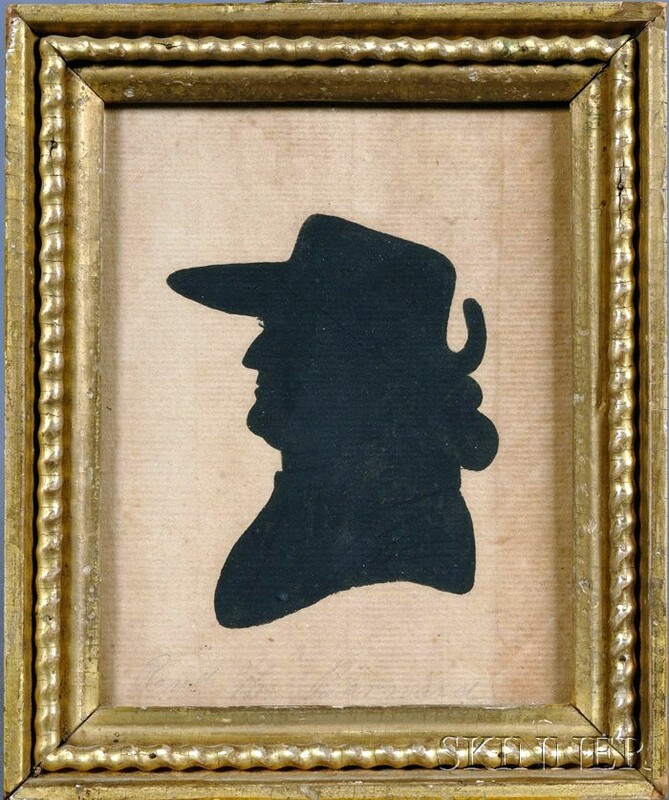 John Singleton Copley, Benjamin Pickman, c. 1758-61, Yale University Art Gallery; John Singleton Copley, Jonathan Jackson, late 1760s, Museum of Fine Arts, Boston; Painted Silhouette of the Reverend Thomas Barnard of Salem, late 18th/early 19th century, Skinner’s Auctions. Obviously I have a preference for Copley, who, like his colleague and compatriot Nathaniel West, represents the Anglo-American/Atlantic world in which the acclaimed artist lived and worked. Both were “American” artists who became “English” artists: they were true Georgians above all. 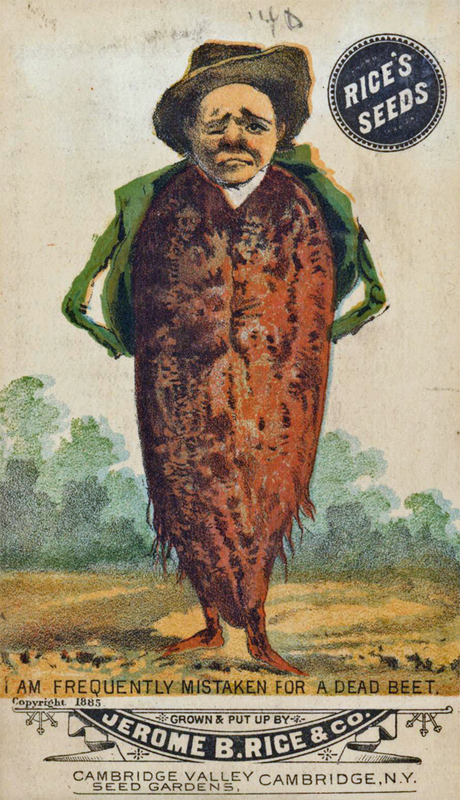 Both left their “country” for good before the American Revolution, along with Henry Pelham, Copley’s stepbrother and the subject of one of his most famous compositions, A Boy with a Flying Squirrel (1765). 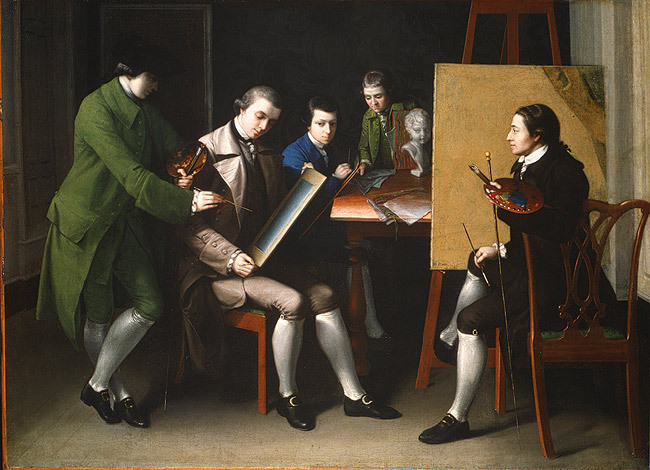 My favorite illustration of this Anglo-American artistic world is a painting of West’s London studio by his protégé Matthew Pratt: entitled The American School, it hints at the future division. 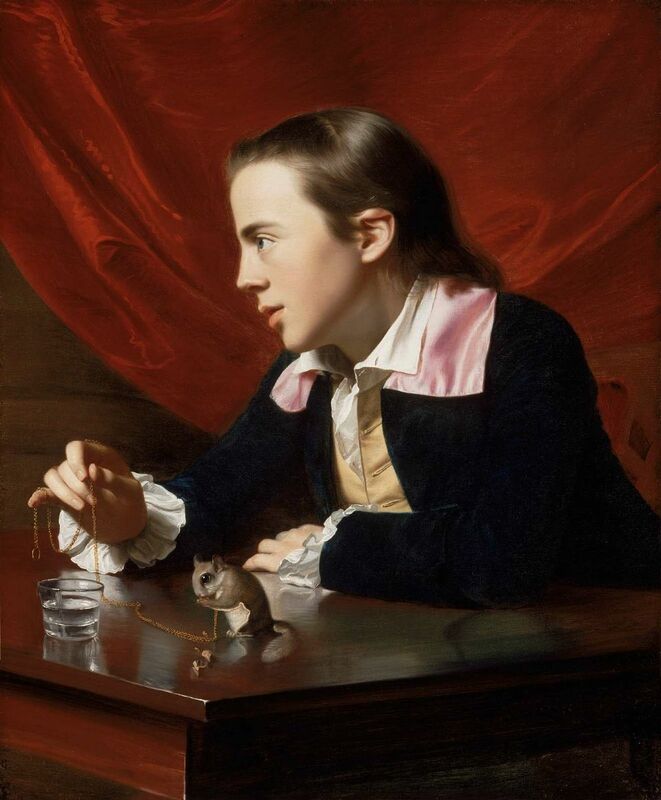 John Singleton Copley, A Boy with a Flying Squirrel, 1765, Museum of Fine Arts, Boston; Matthew Pratt, The American School, 1765, Metropolitan Museum of Art. 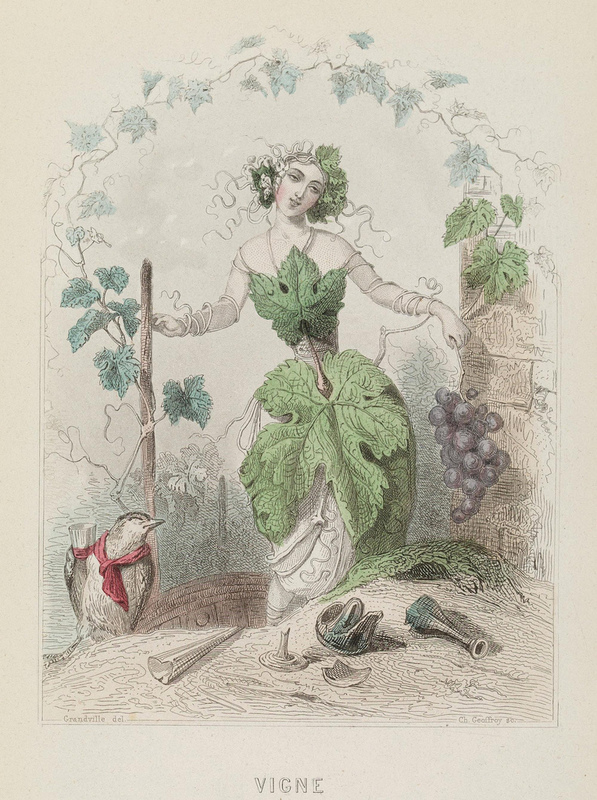 It looks like Georgians Revealed depicts British Georgians as a fun-loving, pleasure-seeking people: there are lots of illustrations of drinking, dancing and dressing: by comparison, American Georgians look rather earnest and restrained. 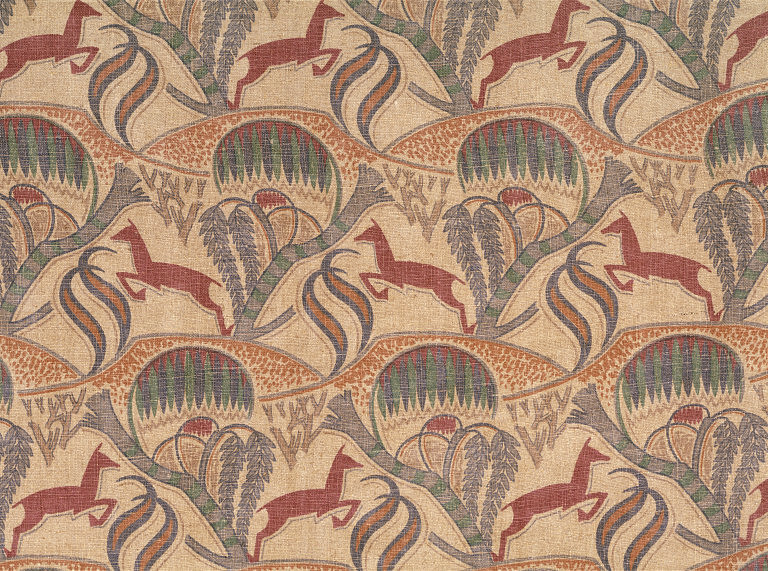 It’s hard to compete with the vibrant print culture that emerged in Britain from the 1780s on, however, just when Americans ceased being Georgians. 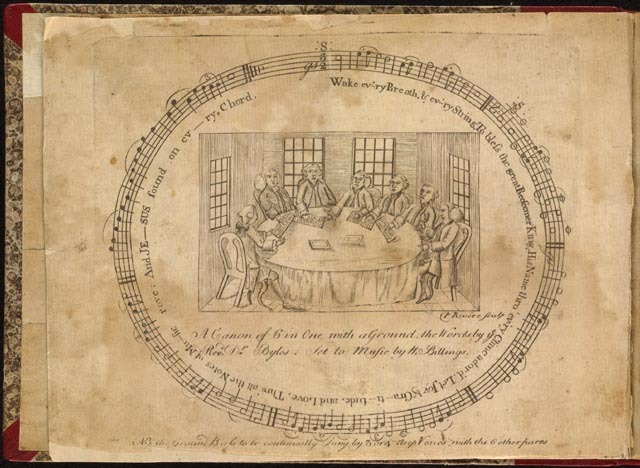 Carousing Georgians in Britain and Psalm-singing Georgians in America: Midnight. 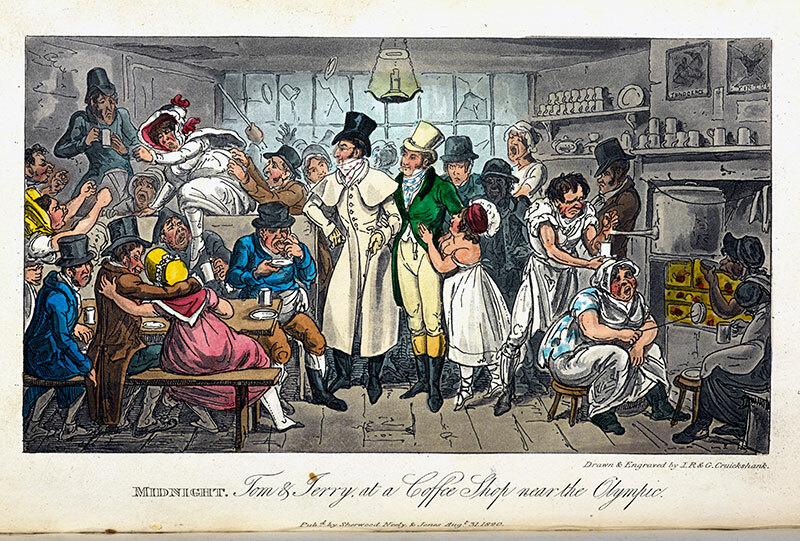 Tom and Jerry at a Coffee Shop near the Olympic, illustration by Issac and George Cruikshank in Pierce Egan, Life in London, 1823, British Library; Paul Revere, “the Music Party”, engraving for the frontspiece of William Billings, The New England Psalm-Book, Boston, 1770. Library of Congress. A blog post by the British Library on their 15th century “Macclesfield Alphabet Book” set me off on a quest for more of these essential (and decorative) educational texts: I figured that I could assemble a sample chronological collection that would span the centuries, and I was right: this is one literary genre that never went out of style, until now, I think. 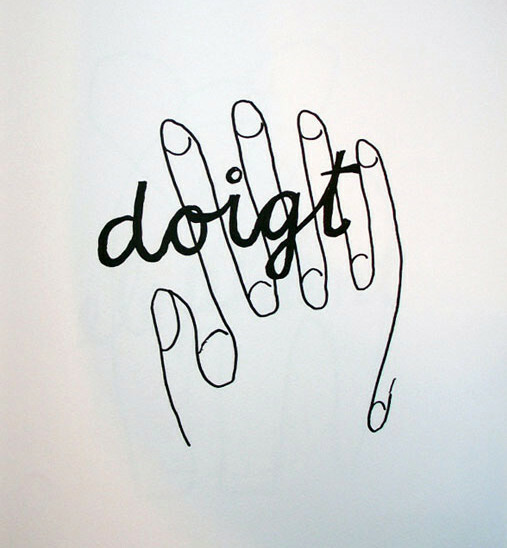 My portfolio of pages was gleaned from books produced both for learning the alphabet (primers) and learning to write, not necessarily the same thing but I make the rules! The Macclesfield text, for example, was written for professional scribes (or their prospective patrons) rather than children; centuries later the two types of texts merged a bit but still had somewhat different aims. 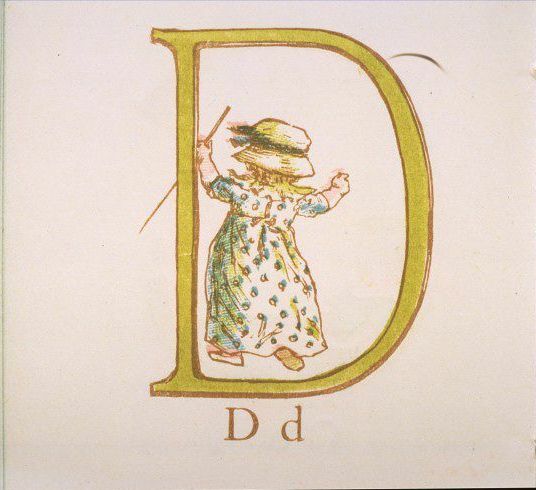 For a better basis for comparison and evolution, I chose the letter D, my first initial. 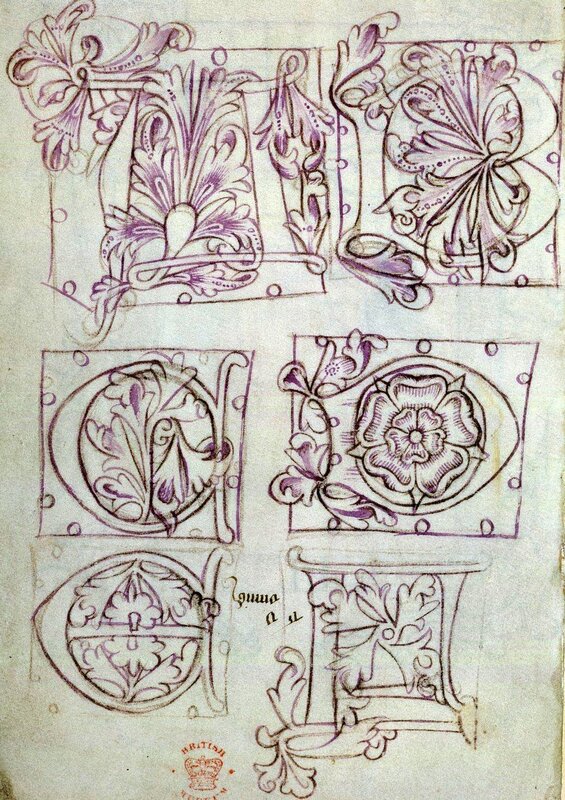 Alphabet samplers from British Library Add MS 88887, the “Macclesfield Psalter” (c. 1475-1525) and Sloane MS 1448a (later 15th century), and the embellished capital D in BL Harley MS 3885, sixteenth century. 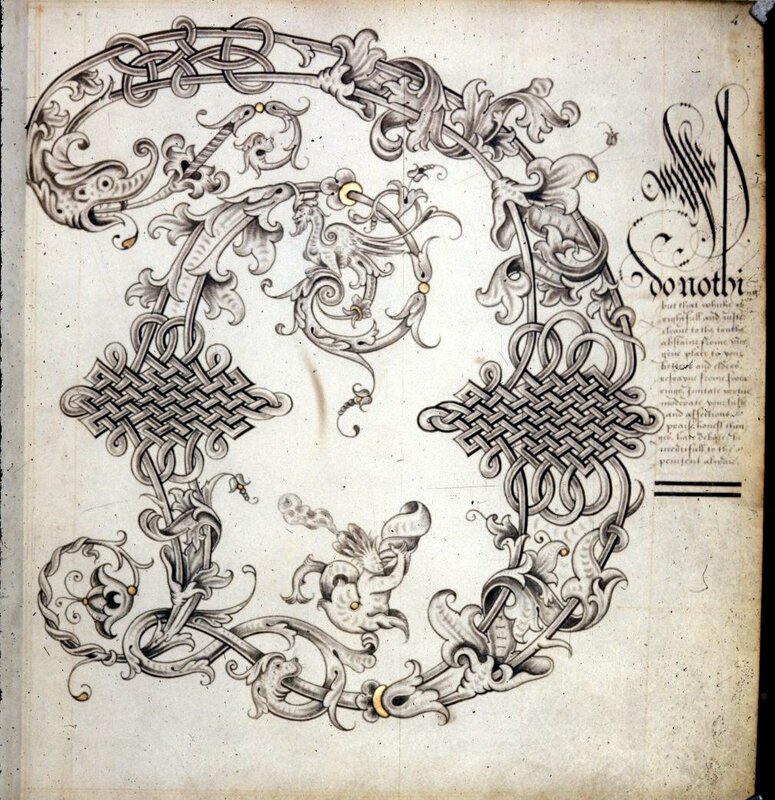 I love that the D in the Sloane MS takes the shape of a Tudor Rose. 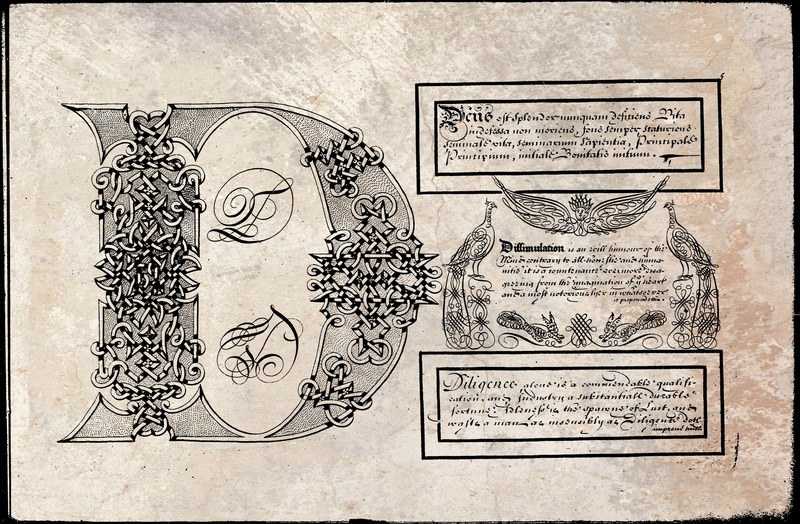 In the seventeenth and eighteenth centuries, alphabet books, or ABCs, are pretty distinct from penmanship or “copy” books; the former were often a religious texts, as in ABC with Catechism, and the latter were strictly secular and far more aesthetically pleasing. 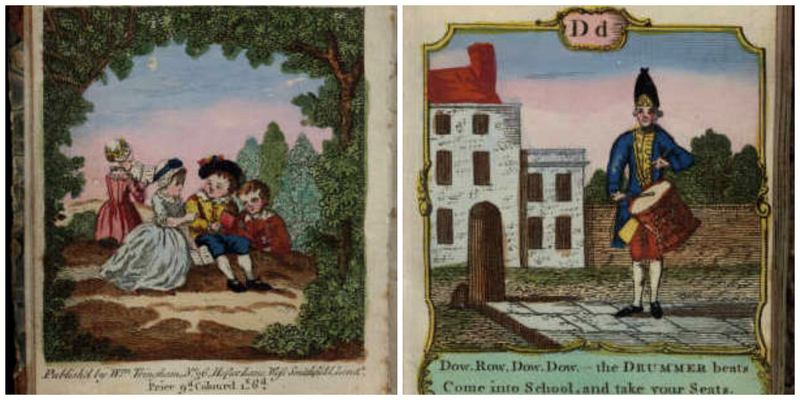 Only towards the last part of the eighteenth century do we see more decorative alphabet books, and they get ever more whimsical over the next century, as children’s literature becomes a distinct and profitable publishing category. Thomas Watson, A Copy Book Enriched with Great Variety of the Most Useful and Modish Hands (1700);William Chinnery, et. al., Writing and drawing made easy, amusing and instructive: containing the whole alphabet in all the characters now us’d, both in printing and penmanship: each illustrated by emblematic devices and moral copies: calculated for the user of schools and curiously engraved by the best hands … (1750); William Tringham, publisher, The alphabet rendered instructive and entertaining (c. 1775), University of South Carolina Libraries’ Digital Collections. 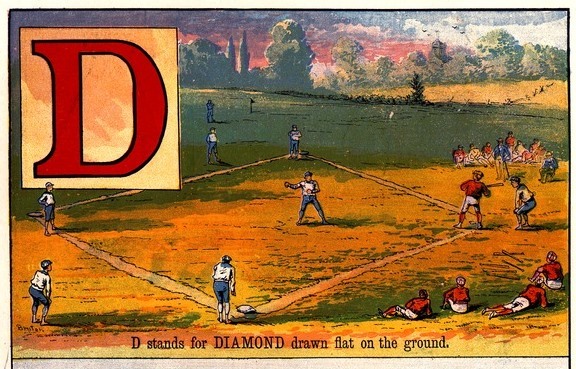 In the nineteenth century, alphabet books were in the capable and creative hands of such prolific illustrators as Kate Greenaway and Walter Crane, publishers like the McLoughlin Brothers of New York issued very specialized versions, and ultimately Man Ray produced an adult variation. 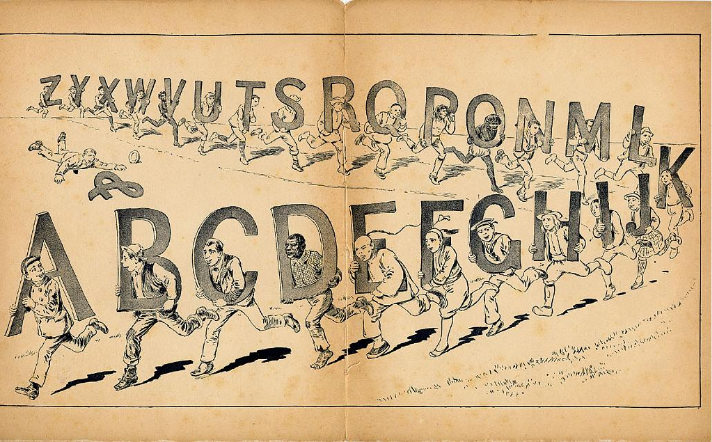 Suddenly the alphabet book is a work of art–or was it always? 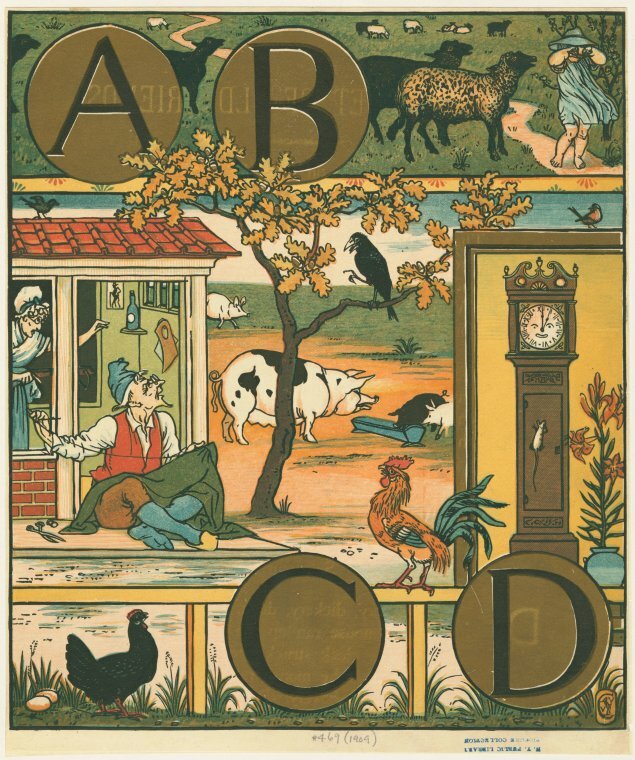 Pages from from Kate Greenaway’s Alphabet Book (1885), Walter Crane’ Song of Sixpence Picture Book (1909), McLoughlin Brothers & Company’s Baseball ABC Book (1885), and Alphabet Country Scenes Book (1900), as well as the French version of Man Ray’s limited edition Alphabet for Adults (1970). 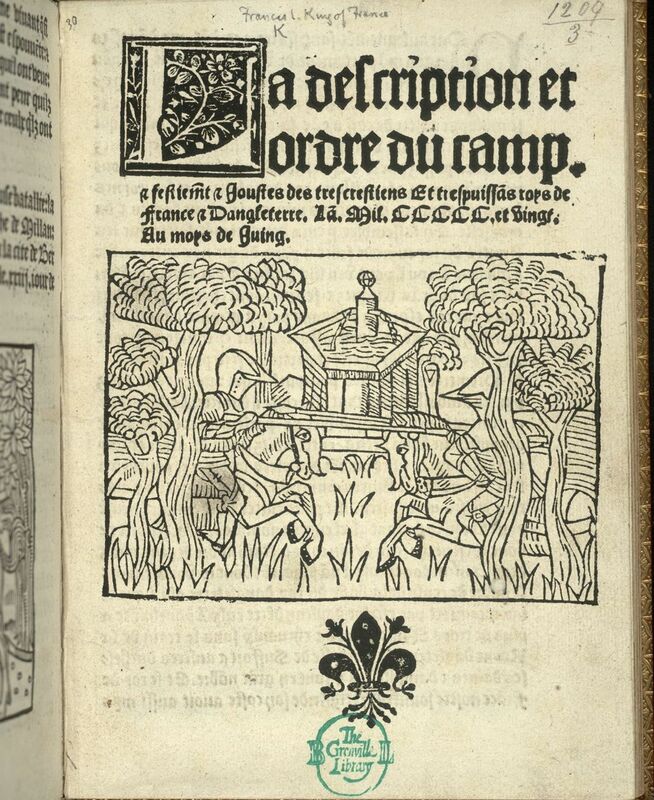 I’m not really the romantic type, but even I can appreciate Pierre Sala’s “Le Petit Livre d’Amour”, the little book of love that French poet Pierre Sala presented to his future wife Marguerite Bullioud in the early sixteenth century. 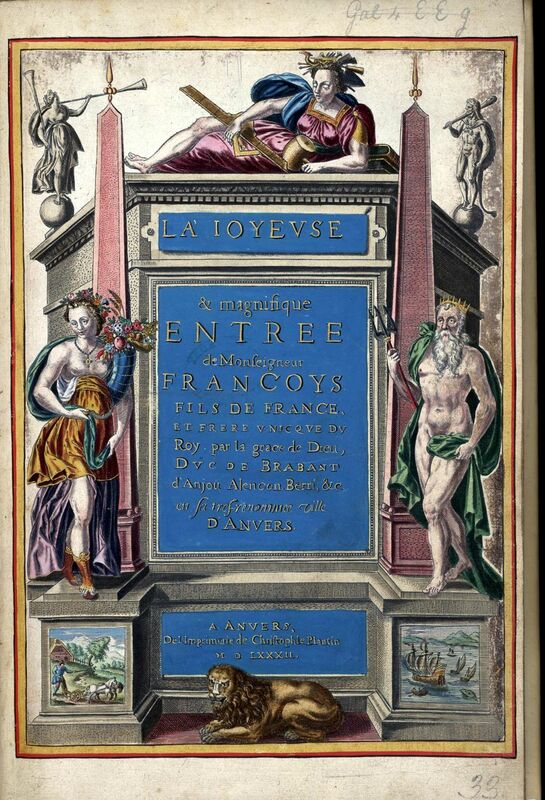 For me, the combination of illuminated miniatures and Sala’s verse are a testament to both personal and courtly love, for Sala was that ideal Renaissance Man, an accomplished courtier to three French kings. 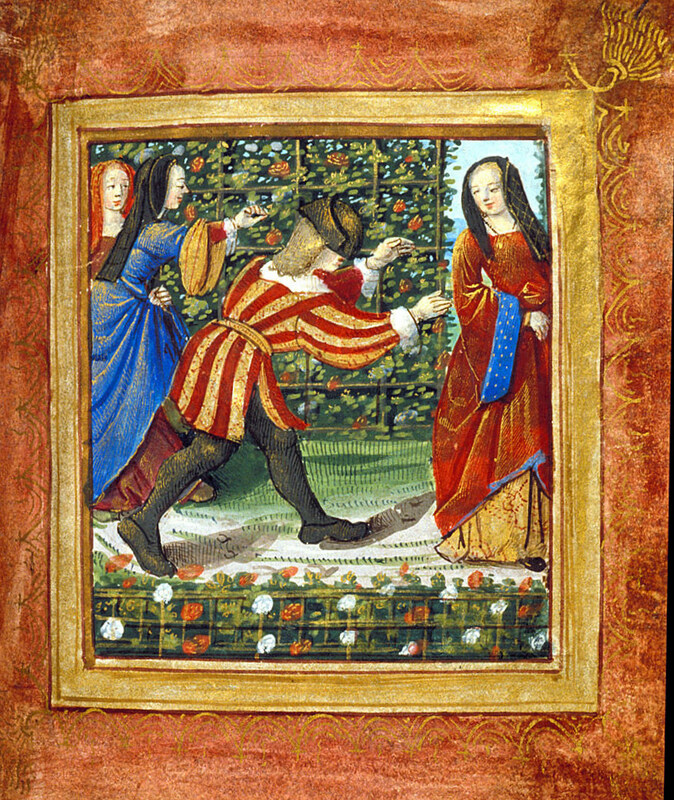 But he was also a rather whimsical poet, and the images (énigmes attributed to the mysterious “Master of the Chronique scandaleuse”) are so completely charming that one cannot help being……….charmed. A look at this little book is the perfect way to start off what has become Valentine’s Day week. Sala declares himself right at the beginning, when he gives his strawberry-like heart to Marguerite, or drops his heart in a marguerite flower, a rather more exotic example of our own marguerite daisies. 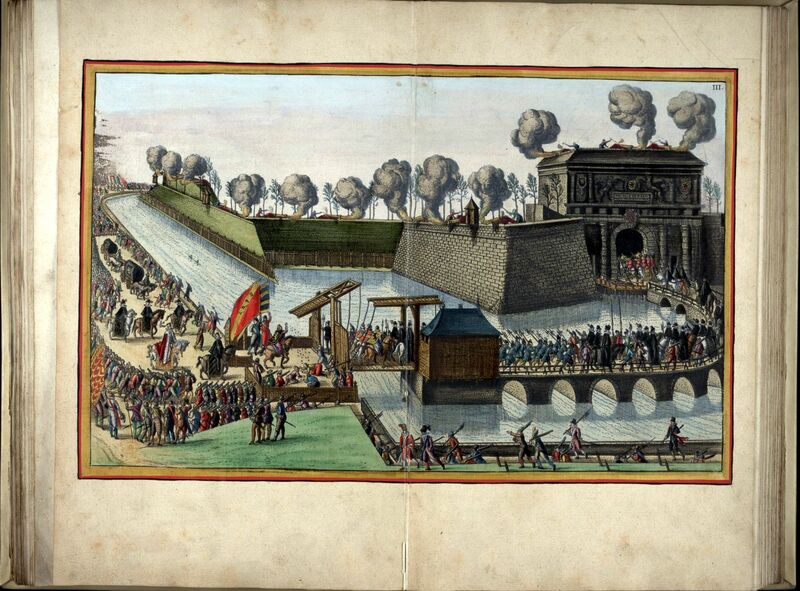 Then it’s games and desperation, as he is parted from the object of his affection. 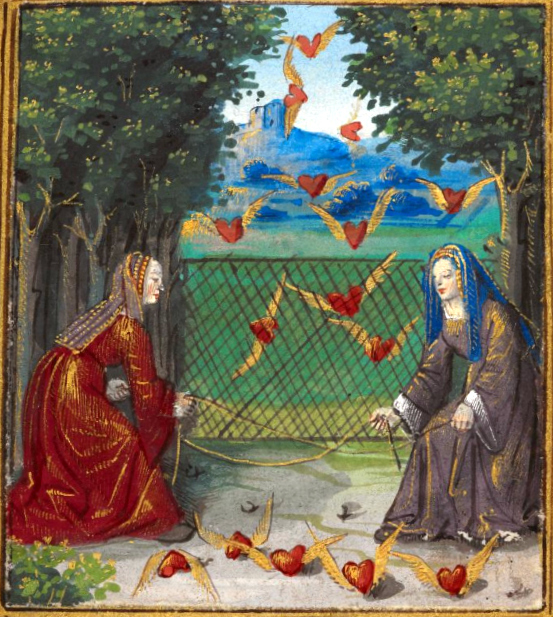 The most captivating miniature is of a pair of maidens capturing hearts, literally: hearts that can easily fly away! 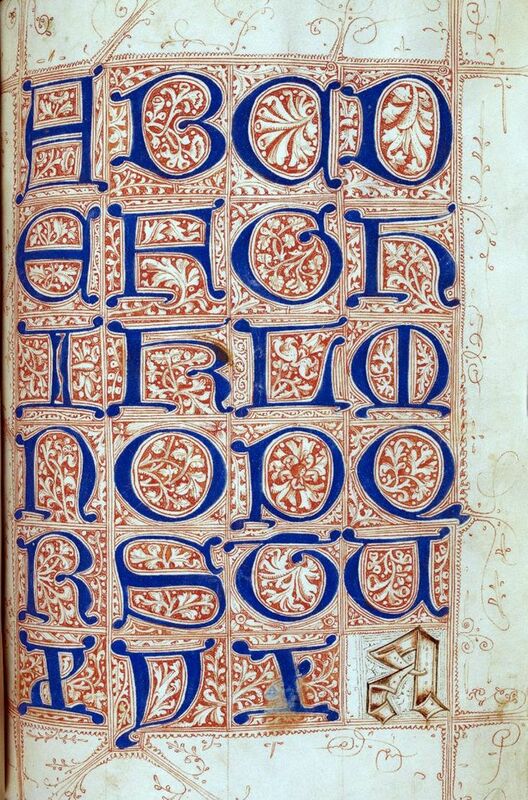 British Library MS Stowe 955. 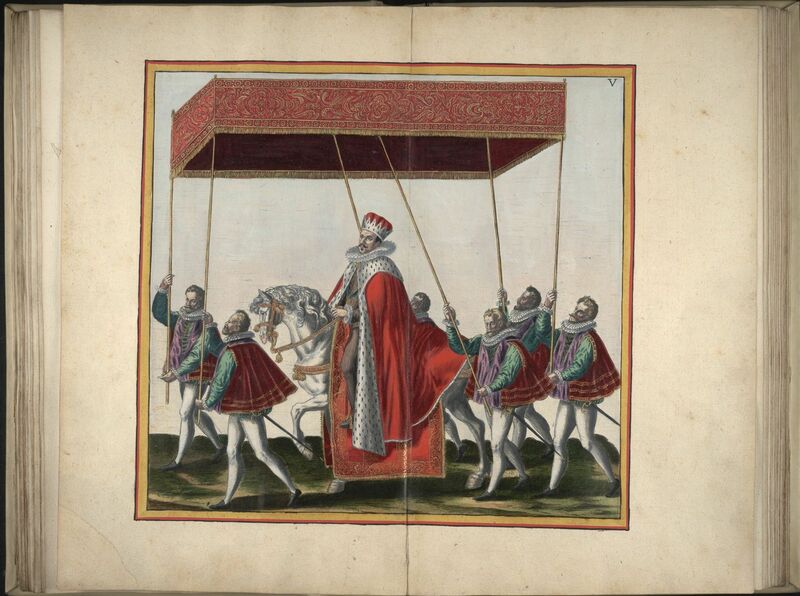 Sala’s book is one of several iconic manuscripts (including da Vinci’s notebooks and Beowulf) recently digitized by the British Library: you can find out more about these treasures here, and additional information and images of the “Petite Livre” here. 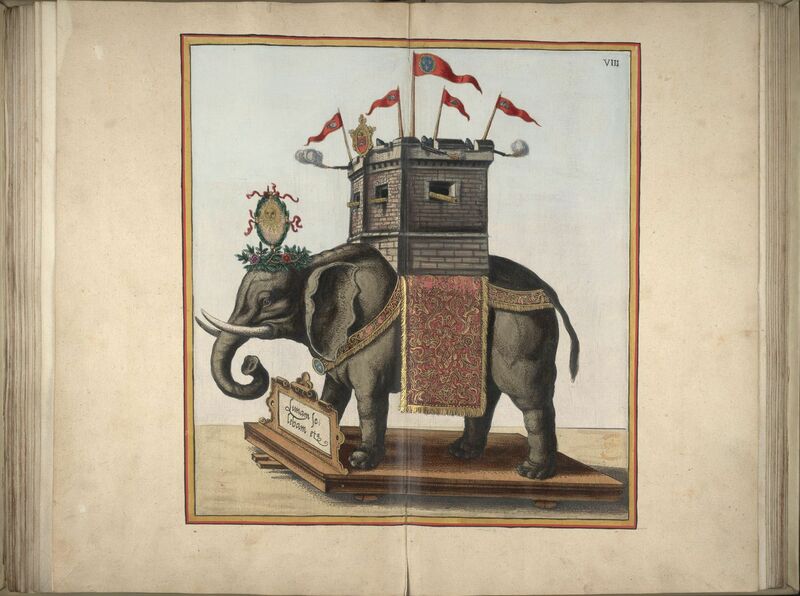 The book was presented (and still is) in its own wooden carrying case, covered with tooled, painted and gilded leather, with the letters “P” and “M” prominently displayed, of course. 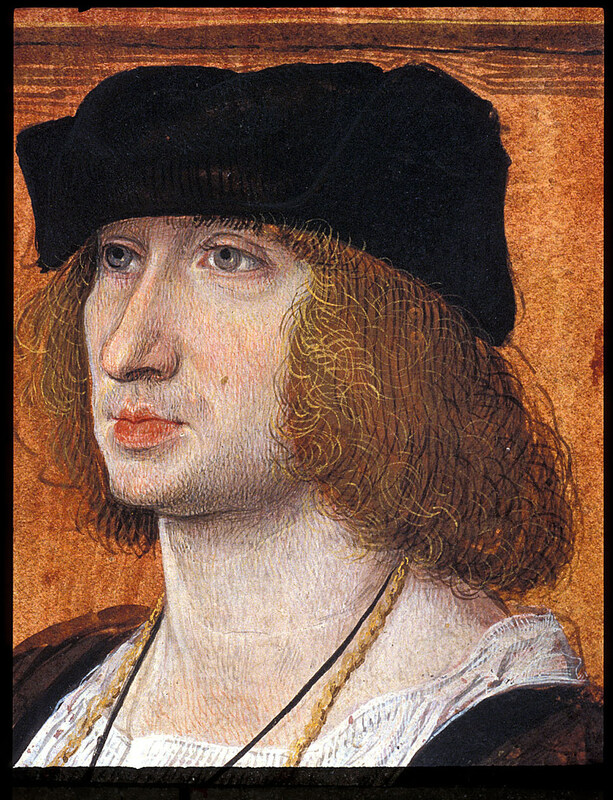 At the end, there is a stunning portrait of Sala, in which he even looks like the ultimate Renaissance man! 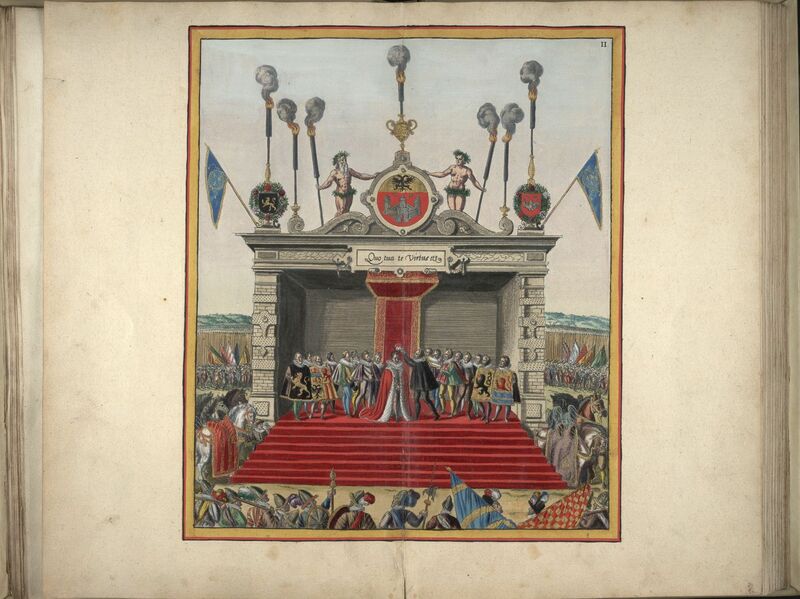 It was painted by his fellow courtier, the royal painter and limner Jean Perréal, who, according to the British Library catalogue notes, was also supposed to paint in Sala’s face in the book’s first heart-dropping image. Somehow that never happened, which makes the book even more charming in its imperfection. 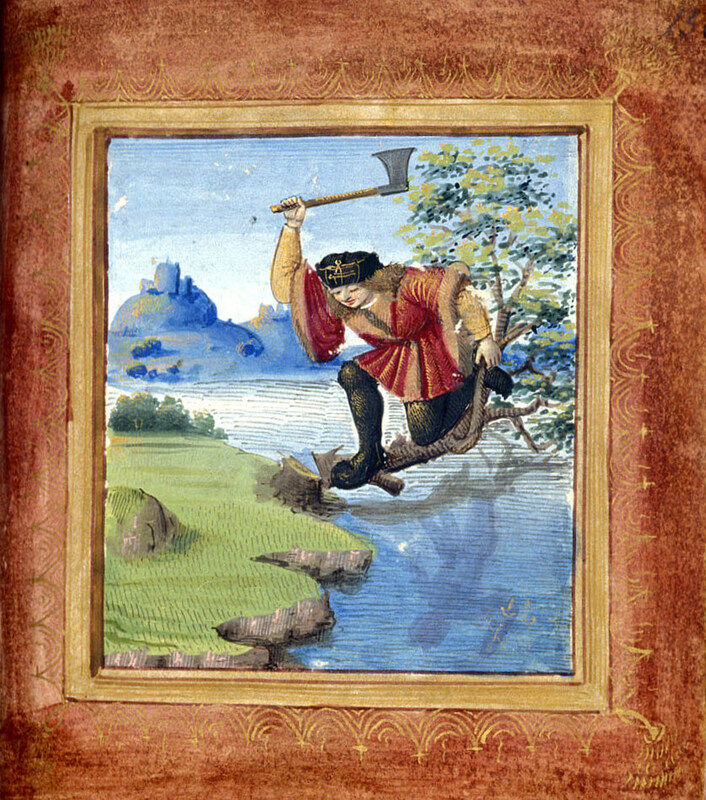 British Library MS Stowe 955, folio 17: Pierre Sala (1457-1529). P.S. There is an apparently-beautiful facsimile of The Little Book of Love out there in limited quantities (for you Romantic types out there) but I wasn’t able to find a copy that was either available or for less than $6500. The chalkboard-painted backsplash in my kitchen( (which is really not a backsplash at all, a topic for another day), in a color called “peapod”, compelled me to find a few more spring green, pea pod accents for the room. 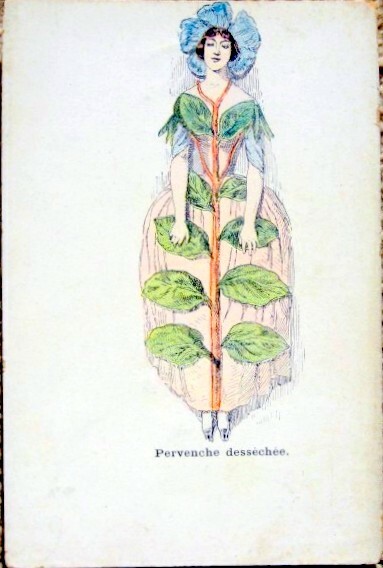 A simple search uncovered one of John Derian’s decoupaged mini-trays, featuring two people dressed in pea pods, an item that I’d seen before but never really took note of. 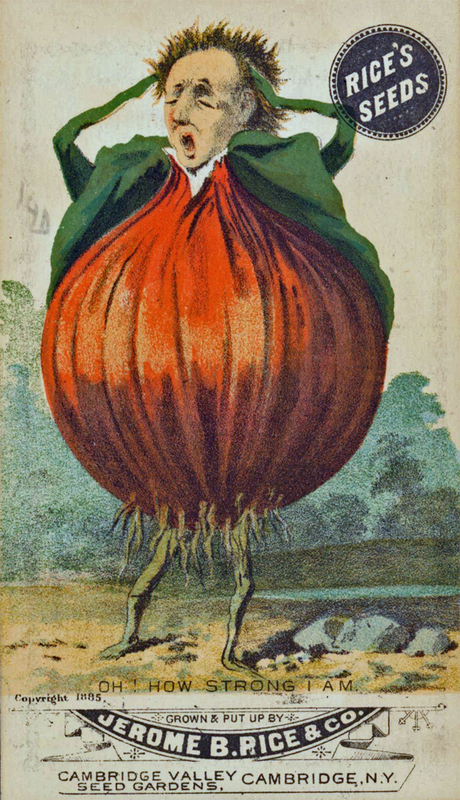 My curiosity about the source of the image led me to the blog of the New York Historical Society, which offered up more of Jerome B. Rice’s trade cards from 1885: not only anthropomorphic peas, but a beet, onion, and potato as well! Interesting that there is a Mr. Potato-body rather than a Mr. Potato Head, one of my favorite childhood games. Jerome B. 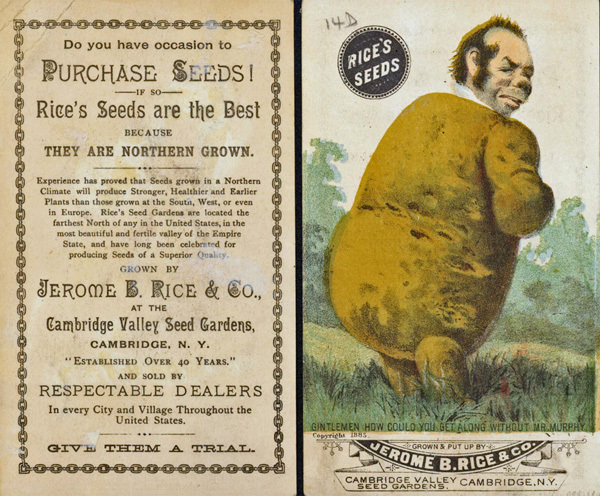 Rice Trade Cards from the Bella Landauer Collection at the New York Historical Society. So now of course I forgot all about my kitchen and went off on a quest for anthropomorphic plant images. 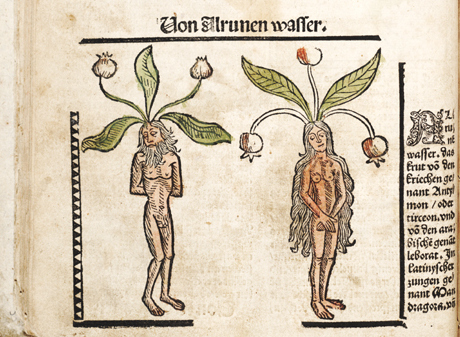 It wasn’t a difficult quest, as I knew where to begin: with the mystical medieval mandrake, a plant with a decidedly human root system which has long been the stuff of legend. 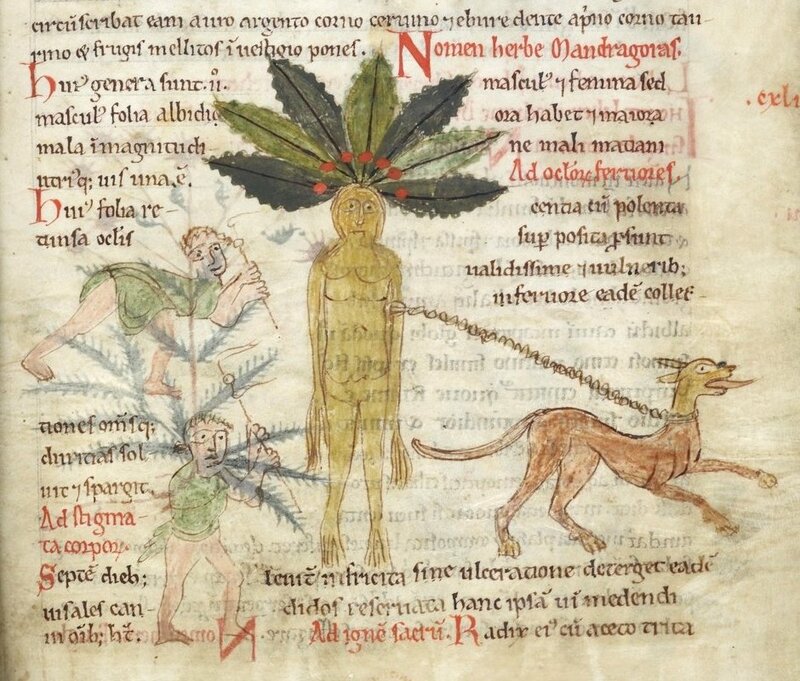 There are biblical references to it, as well as Shakespearean ones, and in between all the medieval herbals refer to the plant that shrieks or groans when it is pulled from the ground, a sound that is absolutely fatal to those who hear it, necessitating a dog-pulling technique if one wants to be bold enough to try. 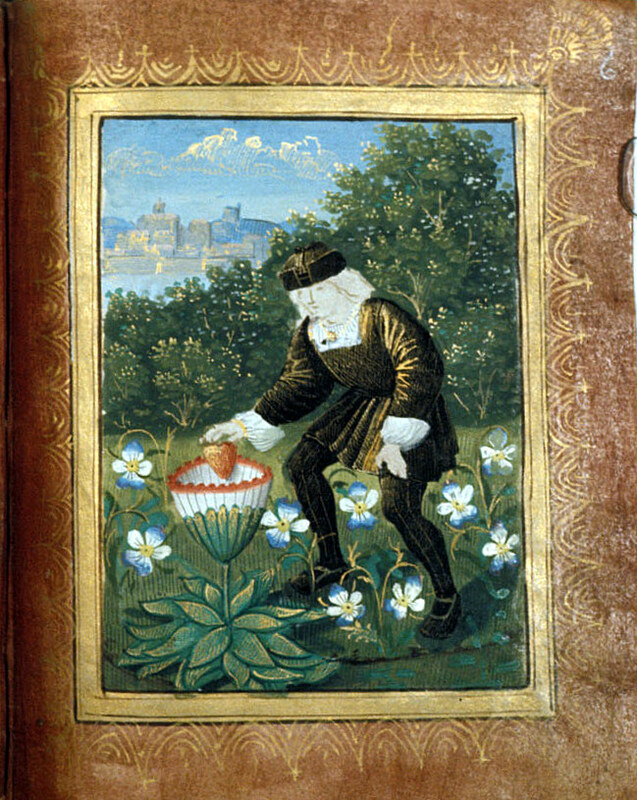 All sorts of secret virtues, both magical and medicinal, are attributed to the plant, from the ancient era to Harry Potter. 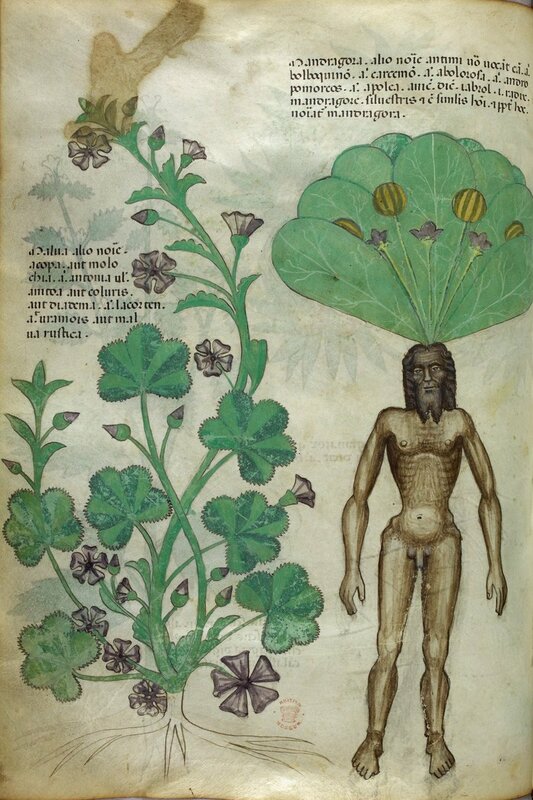 Three views of the Mandrake: Harley Manuscript 5294 (12th century) and Sloane Manuscript 4016 (15th century), British Library, and Hieronymous Brunschwig, Kleines Distillierbuch (1500), Smithsonian Institution. 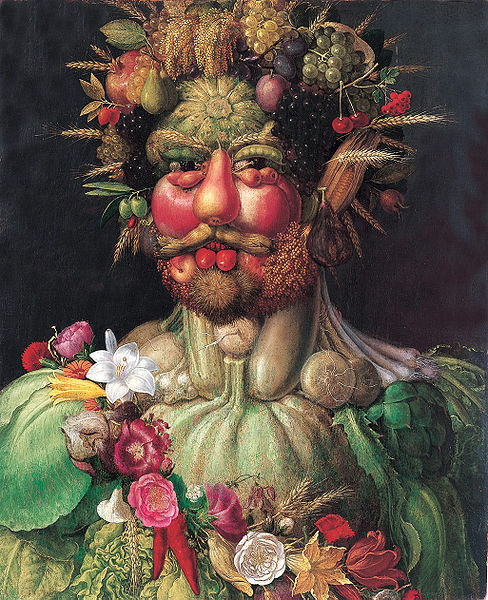 Now it is time for a distinguished late Renaissance plant person: Rudolf II, Holy Roman Emperor from 1576 until 1612 (and avid cultural patron), depicted as Vertumnus, the Roman God of the seasons, by Giuseppe Arcimboldo. You would think that Arcimboldo was on dangerous ground with this “portrait” but apparently Rudolf admired it–I’m sure that the latter knew what he was getting as this painting is very representative of Arcimboldo’s rather whimsical (strange?) works. 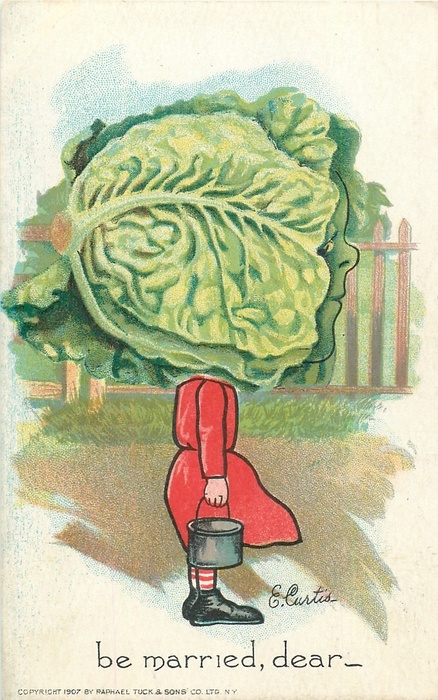 This is an image that never fails to amuse (repulse?) my students; it captures their attention at the very least! Giuseppe Arcimboldo, Vertumnus (Rudolf II), 1590. Note the pea pod eyelids! 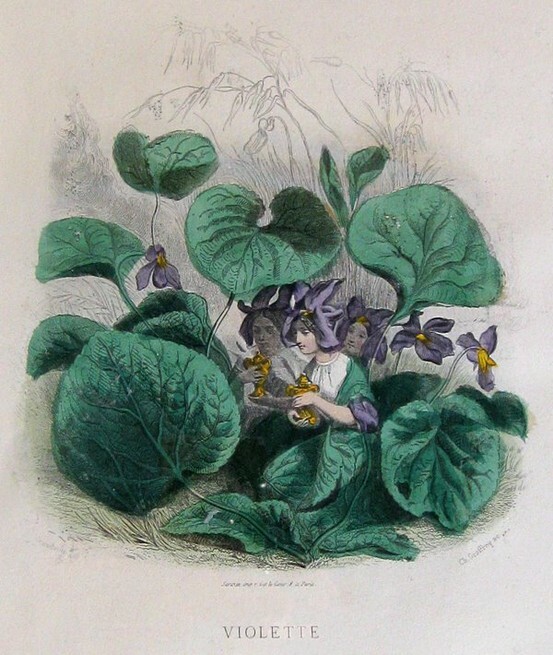 Fast forward to the Victorian era and its obsession with flowers and their essence and meaning, very well expressed by J.J. Grandvilles Les Fleurs Animées (1847) in which a virtual army of flowers begs their commander Flower Fairy for permission to transform themselves: “We are tired of this flower–life. 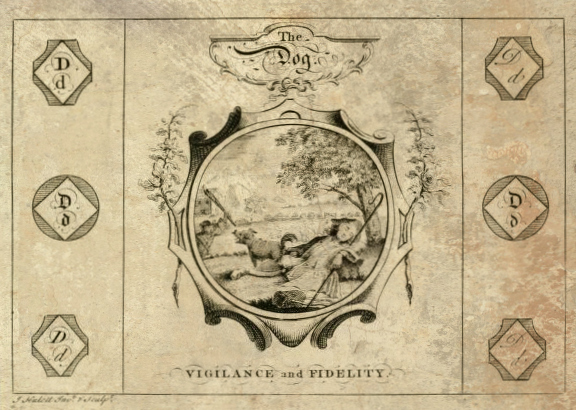 We wish for permission to assume the human form, and to judge, for ourselves, whether that which they say above, of our character, is agreeable to truth.” They receive permission to join the human world, but the 54 etched and hand-colored plates that chart this evolution (devolution?) present them as beautiful but hybridized versions of humanity. 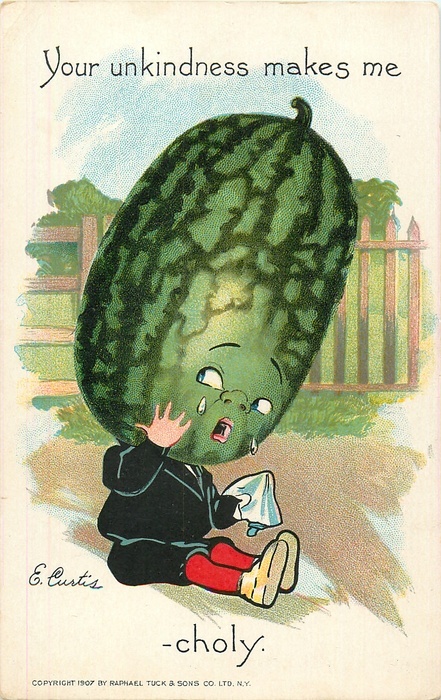 As far as I can tell, the Grandville illustrations were issued as postcards in the 1870s and again around 1900, along with a veritable flood of flower people postcards on the market: sugary sweet floral children and young maidens, which make Grandville’s flower girls look quite sophisticated and artistic. 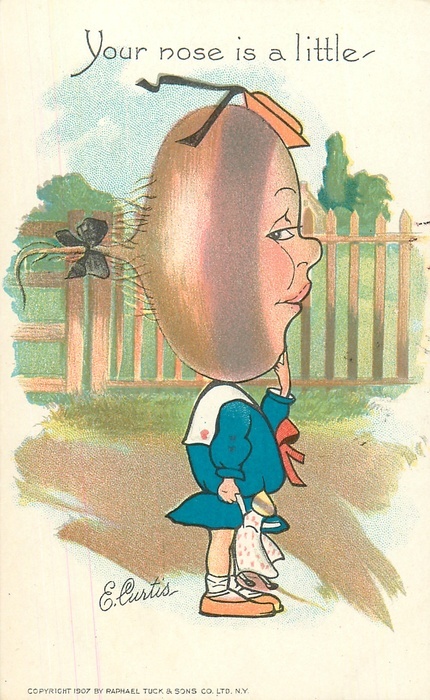 Below is Miss Periwinkle, from a card dated 1900. 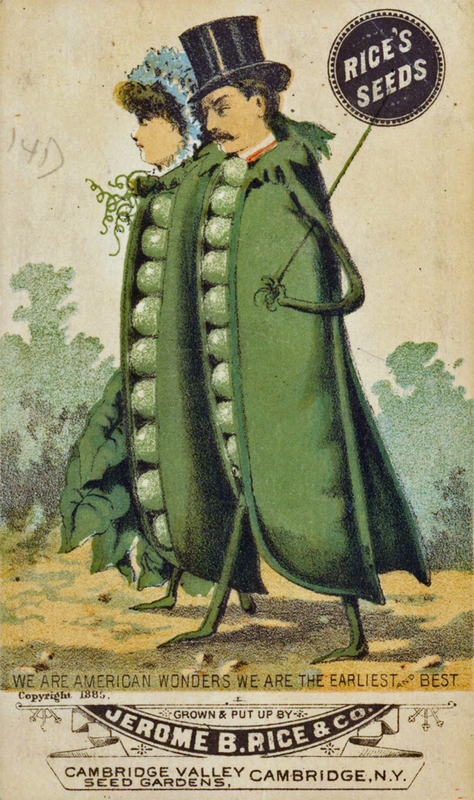 There are so many flower people out there from this era that I have to admit that I’m more interested in the rarer fruit and vegetable people, like the Rice pea pods that started my quest. 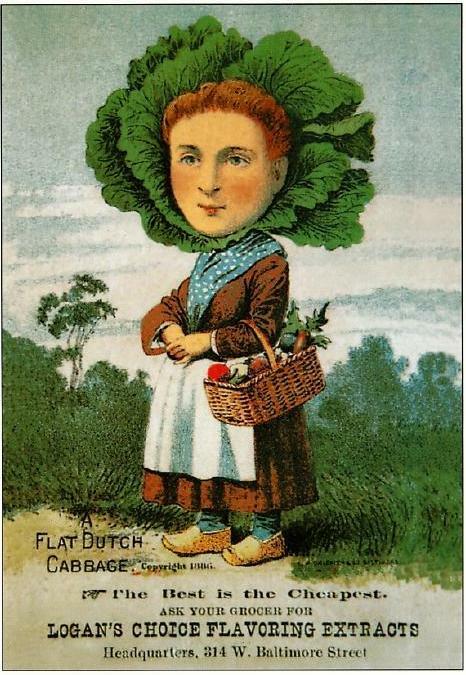 Rice’s trade cards apparently initiated or reflected a trend of anthropomorphic crop images, as illustrated by the “cabbage girl” below (although what Dutch cabbage had to do with the flavoring this Baltimore company was offering I do not know), and a group of radishes from a British nursery in the 1890s. 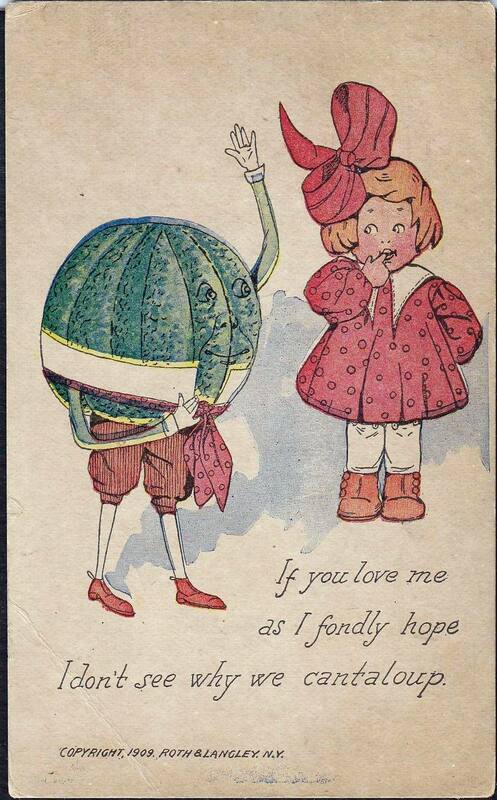 The postcard manufacturers of the new industry’s golden age could clearly not resist the potential that “cantaloupe” (with or without an e) offered for plays on words, so we have several examples from the first decade of the twentieth century: for a romantic attachment, and against: we are too young, dear, we cantaloupe. 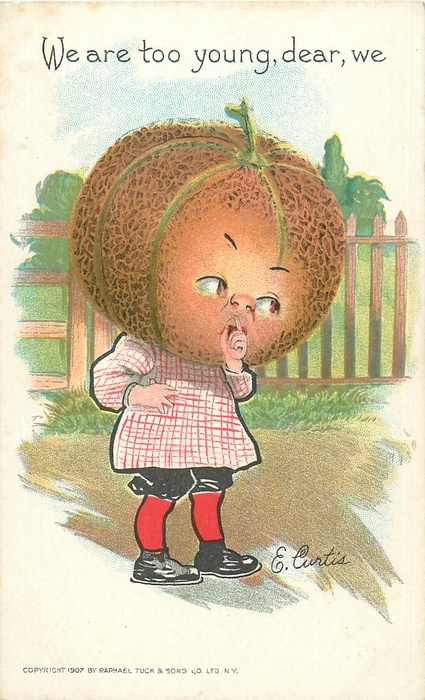 This last cantaloupe card is part of a series entitled “Garden Patch”, illustrated by E. Curtis for the prolific postcard publishers Raphael Tuck & Sons of New York City in 1907 and 1908. 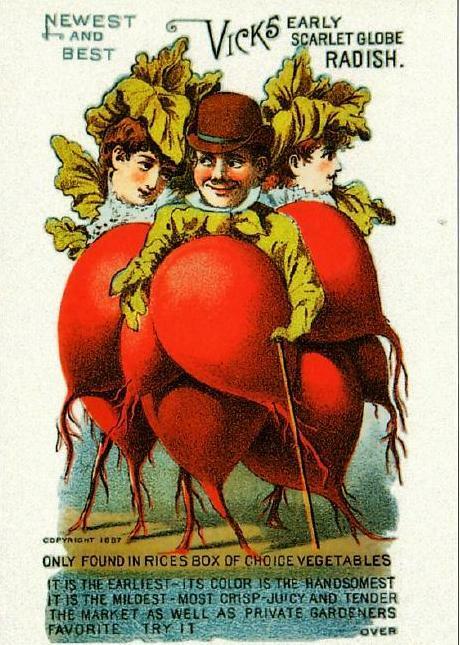 All of the cards in the series can be viewed here , including my favorites: featuring a [water]melon, lettuce (be married), and a turnip (your nose is a little turn [ed]ip). The latter is a bit of a stretch, but at least it gives us a full basket of vegetables. In addition to my chair duties, I am teaching one course this semester, a survey of English history from the Roman era through the Tudors. 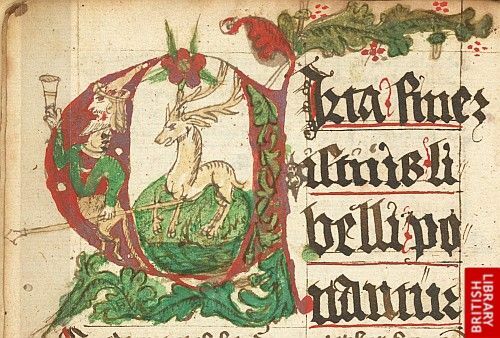 This is a long period, and in order to add more depth to a course that is more characterized by breadth I’m going to bring quite a few illuminated manuscripts (digitally) into the classroom for my students to view and analyze. 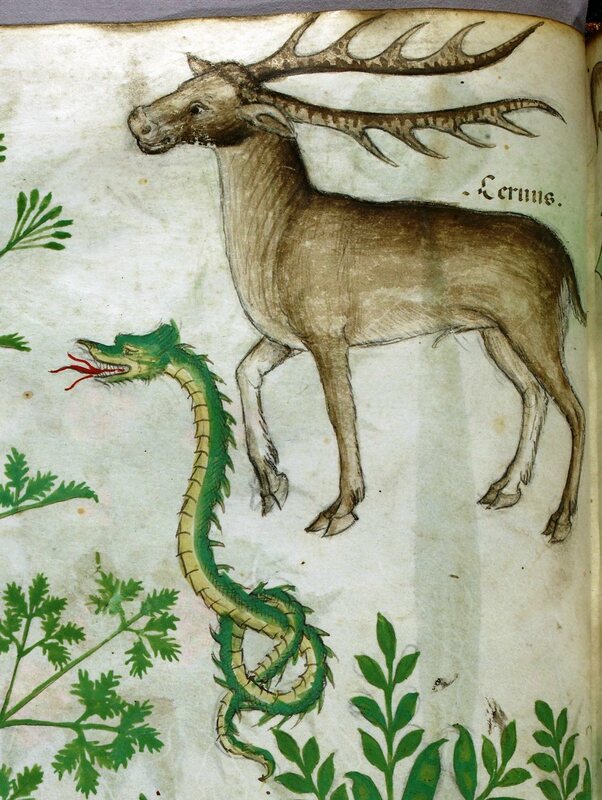 While I was reacquainting myself with some of my favorites this past weekend (via the extraordinary resource that is the British Library’s digital catalog of illuminated manuscripts), I seemed to be seeing lots of deer in the margins, and stags in particular: stags alone, stags as prey, stags with satyrs, stags with serpents (which they can apparently drive out of the ground) and stags parading with other animals. 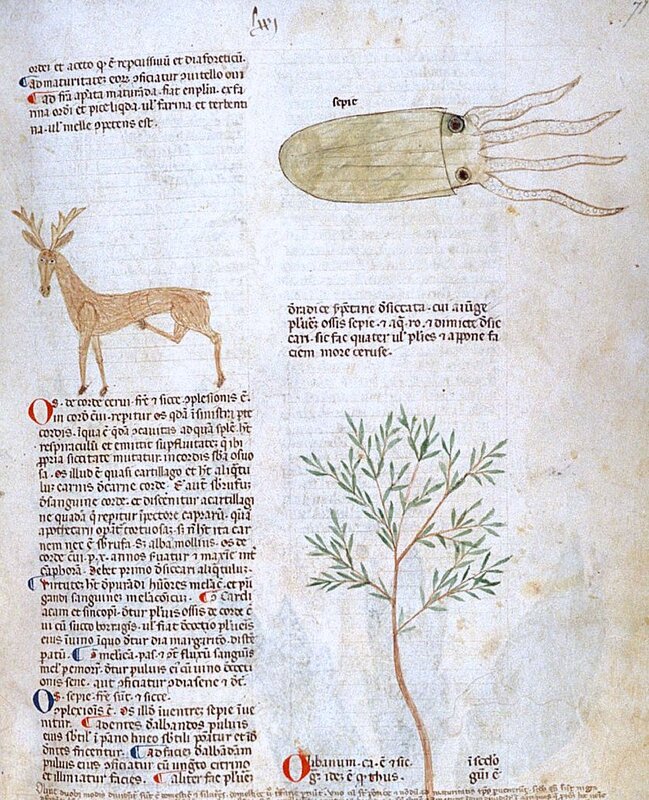 Stags appear not only in medieval bestiaries (encyclopedias of animals) but also in herbals (encyclopedias of plants) because the hardened cartilage of their hearts–os de cor de cervi–was used in medical preparations. 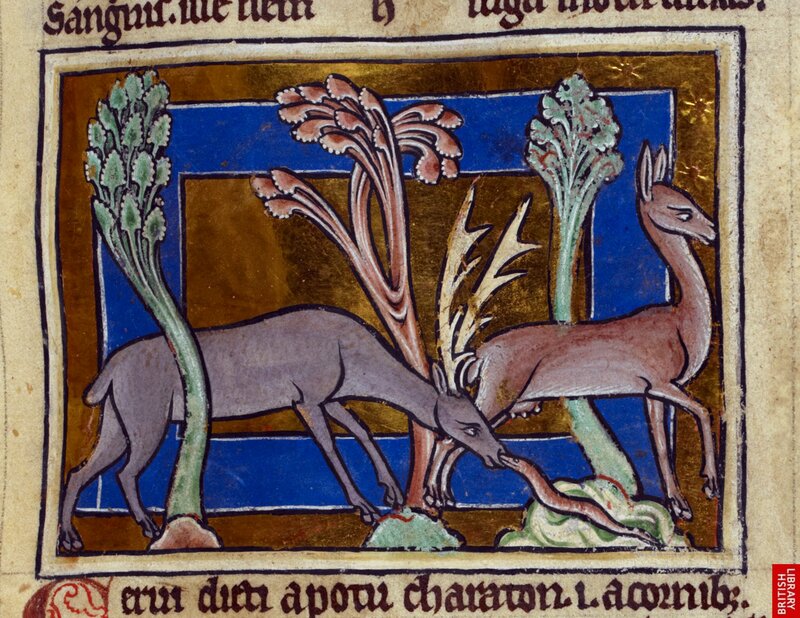 A selection of stags from the British Library Department of Manuscripts: Arundel, Egerton, and Royal Mss., circa 1280-1490. 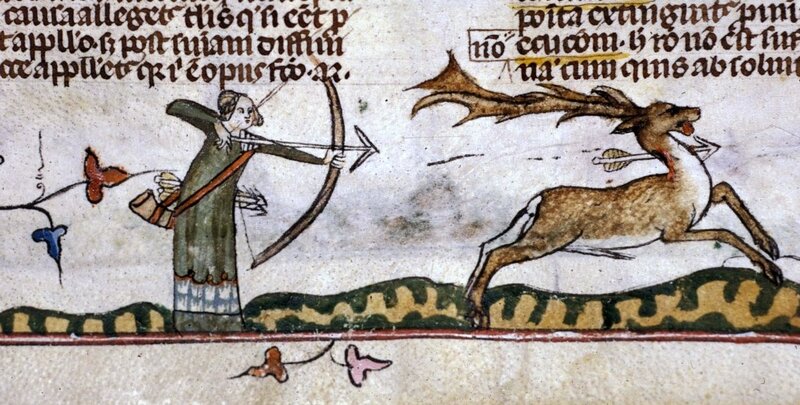 The image of the stag persists into the modern era in visual and material culture more as a symbol of majesty and the (receding) forest than a feature of everyday life. There is the statuesque, noble stag, the leaping stag, and of course, the stag head–a hunting motif that has gained a more general popularity in the last decade or so. 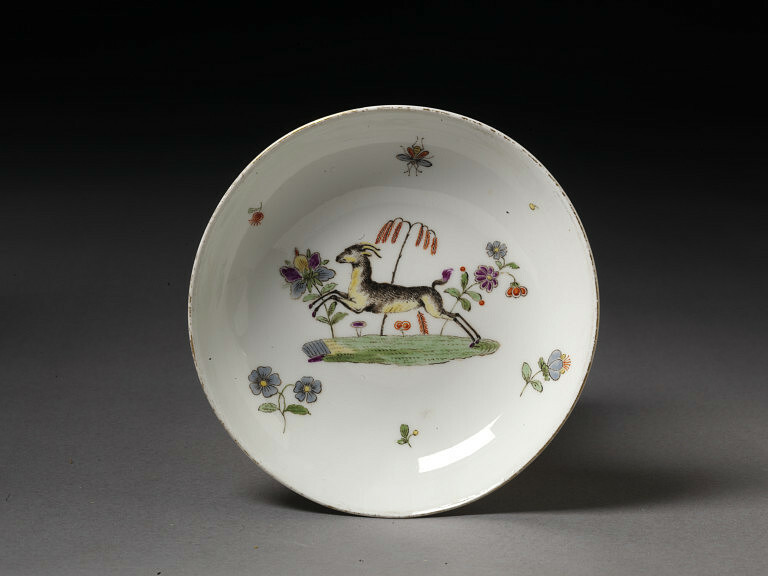 I prefer my deer with their bodies attached, so here are a few favorite images from the collection of the Victoria & Albert Museum: leaping deer on a Meissen plate from the late 18th century, and Foxton furnishing fabric and a Susie Cooper figurine, both from the 1930s. 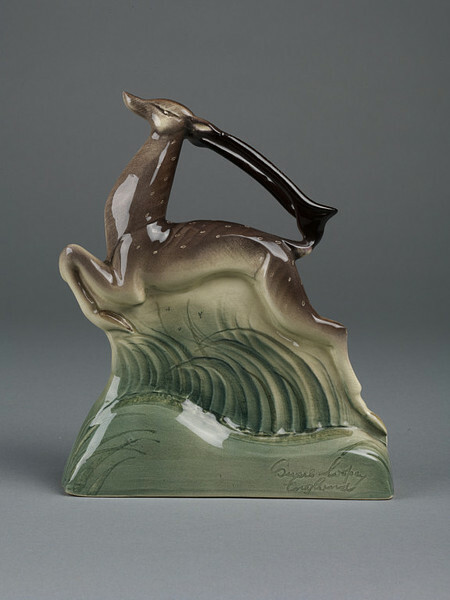 Cooper (1902-1995), the dominant ceramics designer of the twentieth century, loved the leaping deer motif so much that she used it as her company logo and trademark. 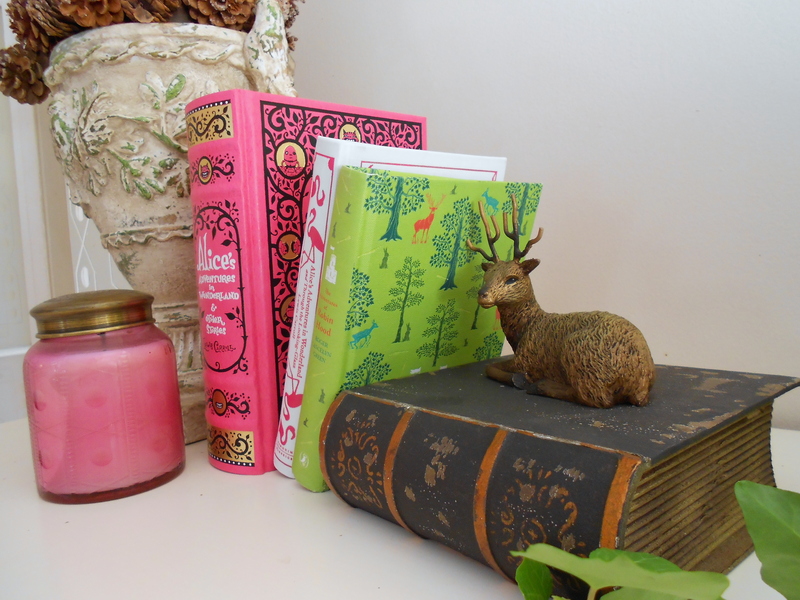 I use a lot of deer for my Christmas decorating, and as I’ve had neither the time or the inclination to do my typical January purge, there’s still quite a few stags around the house. 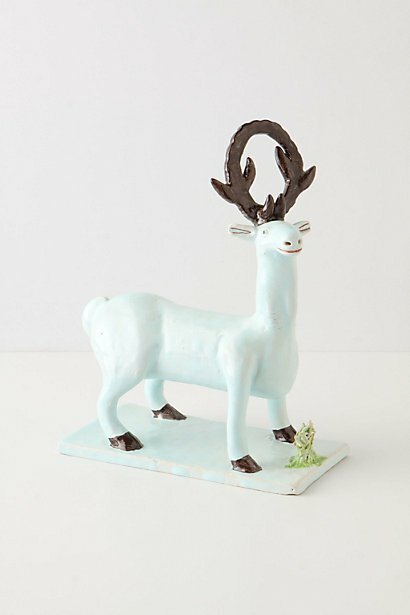 And I’ve had my eye on the Nico Masemula stag at Anthropologie for the last couple of months, now fortunately (for my wallet) sold out. The last days of the year are always a time for reflection and assessment, perhaps personally but certainly by the media. So far, all of the pieces that I have seen on television and in print characterize 2011 as a “year of protest”, following Time magazine’s “Protester” Person of the Year. Like all historians, I find agitation attractive because it signals a time of (exciting) change rather than (boring) continuity, but I’m not certain that this is the case with 2011 yet. Everyone seems so distracted by their various electronic devices, and protesting (and change) takes real engagement. Perhaps this is too American a view, but 2011 doesn’t look quite like 1968, or 1789, or the 177os, or the 1640s, or the 1520s, or the very rebellious period of 1378-1381. 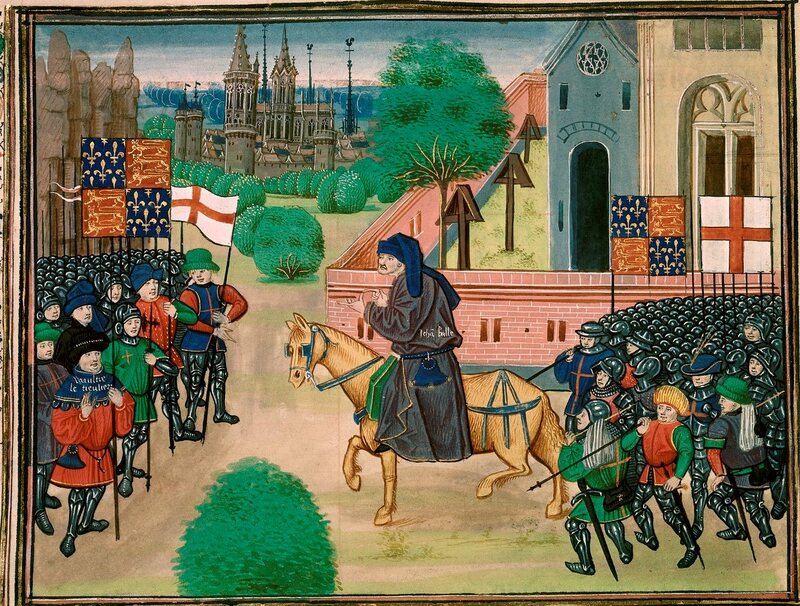 This last (or first) era of rebellion, culminating in the English Peasants’ Revolt of 1381, did not really result in change but was exiting nonetheless for its novelty: the 99 percent seldom rebelled against the 1 percent in the Middle Ages. But the fourteenth century changed everything, bringing forth famine, plague, war and schism in intense degrees and leaving its survivors with nothing left to lose and everything to gain. 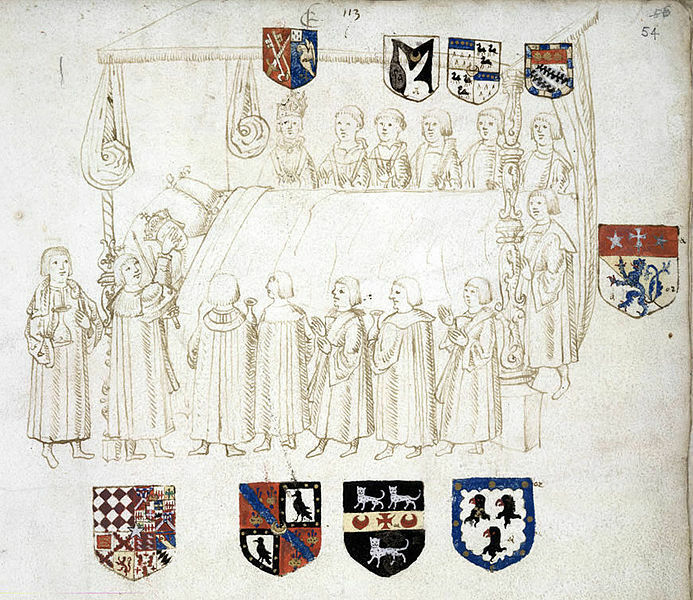 Abandoned by their Church and very conscious of their bargaining power in a world that had lost over 30% of its laborers to the Black Death, the peasants of England marched on London to seek an audience with King Richard II after the imposition of what they perceived as unfair taxes and wage restrictions. 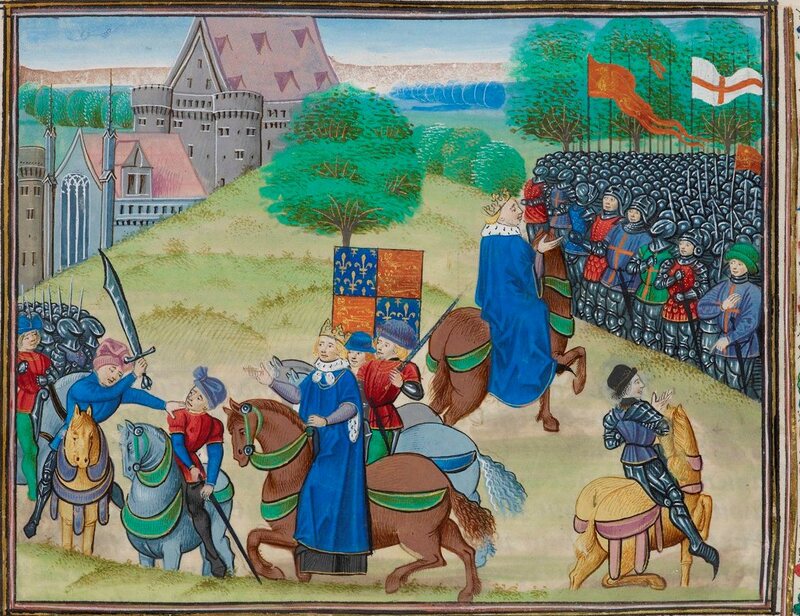 With the charismatic Wat Tyler and John Ball leading them onwards, they got their audience with the young King (slaughtering the Archbishop of Canterbury along the way), but were defeated soon afterwards. 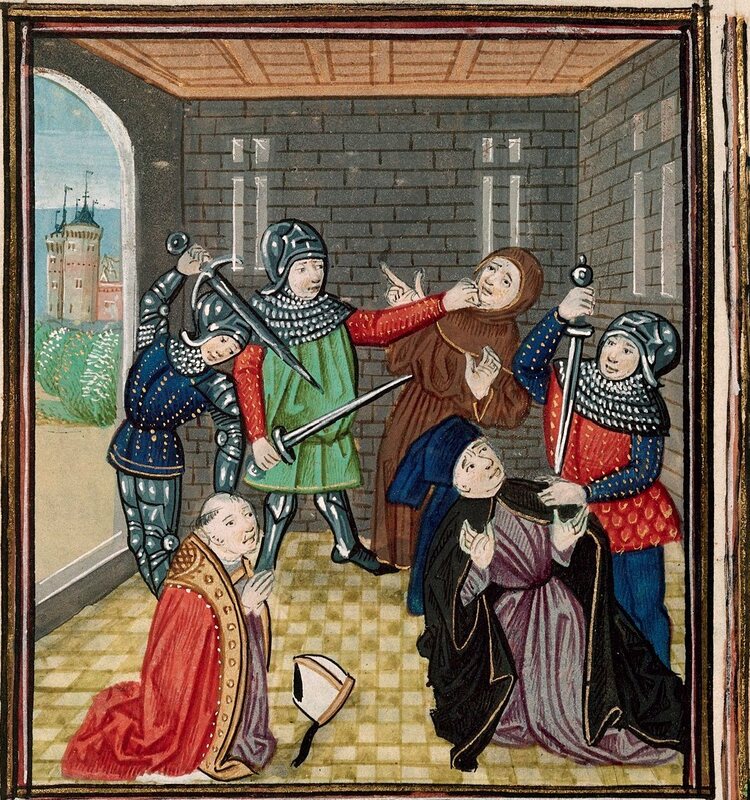 The preacher John Ball leading the peasants, the murder of the Archbishop of Canterbury, and King Richard confronts the peasants, all from the Chronicles of Jean Froissart, British Library MS Royal 18 E I, circa 1483. 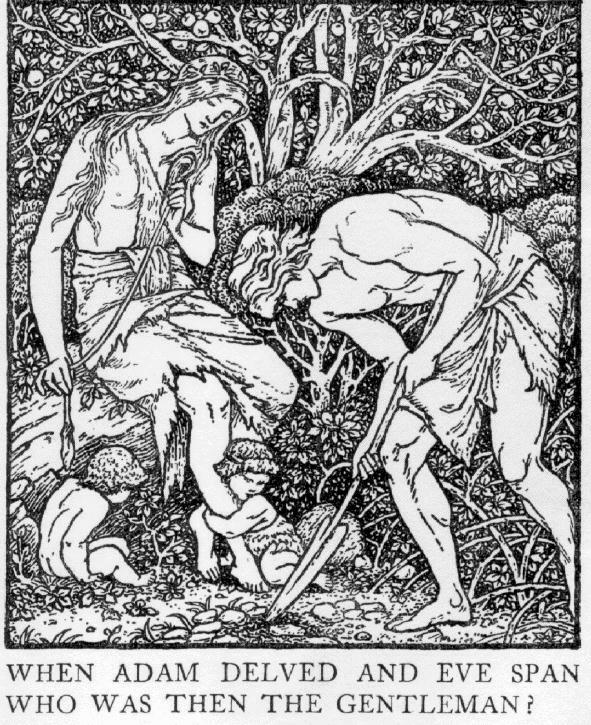 In retrospect, the English Peasants Revolt illustrated, rather than caused, change, but its message, articulated best by a speech attributed to Ball in which he speaks of “liberty” and asks the rhetorical question when Adam delved and Eve span who was then the Gentleman survived and was revived in the modern era, when it reflected even more change. Edward Burne-Jones illustration for William Morris’s Dream of John Ball, 1888.